Want to win some real cash in mobile slot along with some amazing aquatic creatures? 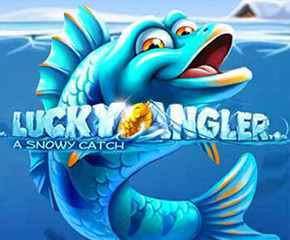 NetEnt’s Lucky Angler video slot is waiting for you, if your answer is yes! The developers have used 3D graphics to design this 5×3 reel and 15-fixed payline video slot. It offers you some beneficial slot game features like sticky wins and free spins that would help you in gaining bigger amount with some frequent wins. Lucky Angler allows you to bet from €0.30 to €150. The best part about this slot that it allows for both-way wins and thus you can take some appealing cash prizes in your gaming account. This video slot is quite impressive because of 96.4% RTP, 41.5% hit frequency and it rewards you €20,000 when you land on the best sequence of high-value symbols. It is a 5.8mb game that has high-class graphical representation. People can bet on all 15 paylines per spin and enjoy the features of this game. One thing you will find quite amazing is reels spin and land on winning symbols like wild, scatter and high value paying aquatic creatures quite frequently. You get to make some underwater living friends too who help you win money in Lucky Angler. These friends are: the red fish, orange fish, blue fish, a lobster and boot. Standard slot game symbols like 10-Ace exist there, but you should concentrate on landing on marine life creatures. The Tuna Fish is the scatter symbol in this slot game and bait is the wild. These two symbols can make your investment double or triple, if you play wisely. 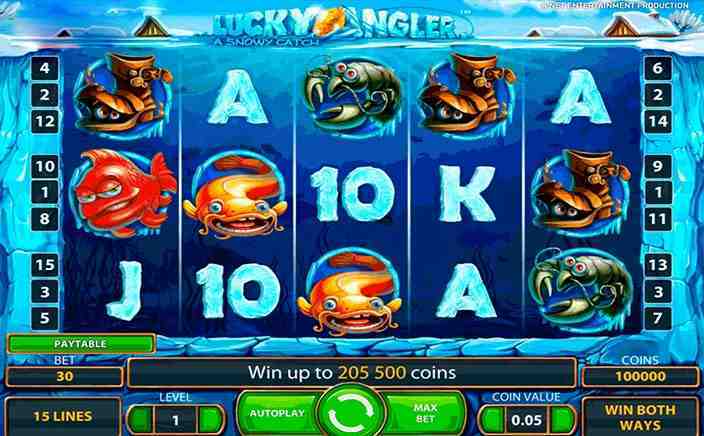 Lucky Angler seems impressive not because of the RTP it has or the bonus features, it is impressive because of the animation players see after hitting a big win. You see that whole screen has becomes lighted and covered in a sheet of ice and suddenly you are channeled into the ice that brings you to the school of little fish. Those colorful fish come out and swim across the whole screen. The free spin feature is triggered by landing on scatter symbols. Land on 3 Tuna Fishes anywhere in the reels and get 10 free spins, landing 4 Tuna Fishes can reward you with 15 and 5 can reward you with 20 free spins. The wilds stick together and land only on 2nd and 4th reel during base game. This feature also takes place during free spin round, but sticky wilds land on the middle reels of the slot machine. This feature is quite helpful in completing the winning sequence of high-value paying symbols with the sticky wilds. High-quality animation with impressive bonus features and smooth game-play helps players in experiencing some big wins. It is an amazing game that is playable across all the devices.